Curious about the life and times of our spectacular admissions consultants? 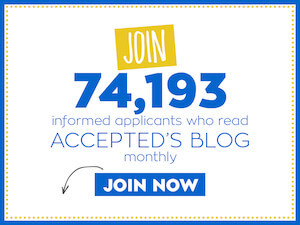 Enjoy our newest blog series in which we interview the fabulous people who make up the Accepted.com staff. Next up is…Jennifer Bloom. Accepted: Can you tell us a little about yourself? Where and what did you study as a student? Jennifer: I was born and grew up in the US, and I graduated from Columbia University, where I studied Political Science and Economics. I didn’t realize at the time, but I was really getting an education in how to write, organize, and dissect essays. Accepted: What’s your favorite non-school/non-work book? Jennifer: This is too difficult of a question for me! At any given time, I am listening to an audiobook (typically fiction), reading a non-fiction book (typically parenting), and reading a book for my Book Club. So I would say my favorite non-fiction book is Erik Larson’s Dead Wake, about the sinking of the Lusitania (awesome book that proves that even packing lists can make entertaining reading material! ); my favorite parenting book is How to Talk So Kids Will Listen, Listen So Kids Will Talk by Adele Faber and Elaine Mazlish; and favorite fiction book would probably be Cutting for Stone by Abraham Verghese, though there were definitely scenes from this one that were painful and a bit nauseating to read (again, a sign of great writing!). I also highly recommend audiobooks like The Help, which are read by multiple actors and really make you feel like you are in the room with the characters telling their story. Accepted: Where do you currently live? Does living abroad help you feel more connected with international applicants? Jennifer: I have lived in Israel for the past 20 years. Because Israel is such a melting pot of diverse cultures – I have neighbors who moved here (or are first generation children of parents who moved here) from Yemen, Tunisia, Morocco, Ethiopia, South Africa, England, and former Soviet countries – I understand a lot of different mindsets and can quickly connect with my clients around the world. My location in Israel also helps me connect physically with my clients: I am only 5 hours behind Hong Kong and Mainland China, only 2 and a half hours behind India, 2 hours ahead of the UK, and in the same time zone as Russia, Eastern Europe and Turkey. Even clients in the US benefit from my location since I can schedule calls with them before or after their workday. And of course, there is the added benefit of Sunday being a full workday here in Israel, so even on the weekend when applicants are trying to cram in a lot of their essay writing, I’m available to guide them! Jennifer: A lot of stars collided to bring me to Accepted! After working in investment banking in New York City, I picked up and moved to Los Angeles to join a non-profit. When I moved to Israel, I began helping students prepare for the GMAT’s Analytical Writing section and write their application essays. At the time, Linda Abraham was expanding Accepted.com – the internet was just becoming the venue by which consumers sought services! I’ve been with Accepted.com for almost 17 years now. Jennifer: My clients!! I cannot imagine another career that allows me to get to know clients so personally, digging to discover what makes them special and helping them highlight those attributes in 500 words or less in their essays. I pride myself on being especially responsive – I aim for one business day turnaround – and caring – your pipe burst, your apartment is flooded, and your laptop is dead? You can cry to me on the phone first and then rest assured that I still have copies of your drafts – with notes on how to improve them! My favorite thing about consulting is showing my clients what it means to be truly cared about. Accepted: Do you have other qualifications that contribute to your interest and skills as a consultant? Jennifer: I love writing resumes! I love taking 20 pages of notes about someone’s career and turning that into a one- or two-page document that is easy to read and screams “Accept me; I’m perfect for you!” I earned my Certified Professional Resume Writer certification 10 years ago and write resumes for professionals in a variety of industries, not just graduate school applicants! Jennifer: I work mostly with MBA applicants, but over the years I’ve helped applicants to all kinds of graduate degree programs – from traditional law and finance programs to speech pathology and the World Economic Forum’s Global Leadership Fellows! No matter what the program, I help applicants see what the program is looking for and then help them identify the experiences in their own background that demonstrate their fit. 1. International applicants need to recognize that they are competing for a spot against many qualified candidates from their home countries. All of the top schools could fill their classes many times over with just “Ivy League” graduates, Bain/BCG/McKinsey consultants, or Goldman/Morgan Stanley/JP Morgan bankers. But they don’t want to do that; they want a diverse class of students that share a few key attributes to learn together, so your job is to demonstrate that you have those attributes and interesting experiences to share. 2. Always look at the qualities that the school asks your recommenders to judge, and use these as your guide as to what is important to the program. For example, among other attributes, Wharton asks recommenders to gauge an applicant’s ability to manage uncertainty. Isn’t that interesting? Stanford asks about an applicant’s ability to build partnerships both inside and outside the organization. Gets you thinking, right? 3. Your resume is often the first piece of paper that your application reviewer will look at. Make sure it has a lot of white space to ease the reader’s job, and focus it on examples in which you have demonstrated the qualities that the school is seeking. A strong resume is also a great asset when you get to b-school since summer internship recruiting starts just a few weeks into the program! Learn more about Jennifer and how she can help you get accepted! Last updated on September 17, 2015.